Life has been tough for Bridget, but now she setting sail for Australia, where she is to start a new life. She isn’t afraid. Nothing could be worse than staying in Ireland and starving to death. Still, she cries for what she is leaving behind – her mother and brothers in the work house and her father and grandmother, both dead. In Australia, too, she finds that though life might be better, her strong spirit might land her in trouble. 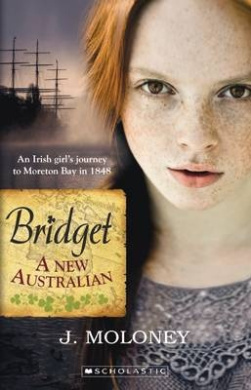 Bridget, part of Omnibus Books’ New Australian series is set in and after the time of the Irish potato famine of the mid nineteenth century, and shows both that famine’s effects as well as the resultant scheme which saw poverty stricken Irish shipped to Australia. Although not convicts, Bridget and her fellows travellers have few rights and must adapt to life in a very foreign land. Suitable for readers in middle primary and older, Bridget is historical fiction with broad appeal. Bridget is a likeable narrator who readers will enjoy getting to know.